A lecture given to the American Atheist Society in Ann Arbor, April 19, 1985. John Allegro argues that the Christianity of the New Testament is a weave of many threads. It has little to do with historical circumstance, unless to recall the possible fate of the Essene Teacher of Righteousness. It has much to do with key elements of Essenism, hidden in names, titles and story motifs; and with Old Testament prophecy; and with Jewish cultic beliefs and practices which go back to ancient fertility religions. All these are woven with Hellenistic mystery cults and myths into the Pauline theology of Christos. 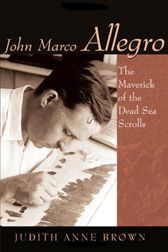 ← John M Allegro – “The Dead Sea Scrolls: A Cover-up?” April 18, 1984.